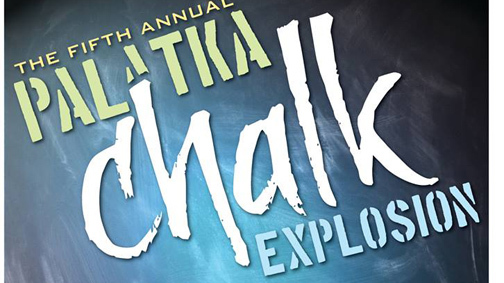 PALATKA – The Arts Council of Greater Palatka presents the annual Chalk Explosion Saturday, Sept. 29, in the 300 block of St. Johns Ave., joining with the annual St. Johns River Bartram Frolic for this fifth annual chalk event. The Chalk Explosion, free and open to the public, features four professional chalk artists, a free street chalking competition with prizes and chalk for all ages to help decorate the street in downtown Palatka. Competition artists check in from 8 to 10 a.m. Artwork will be judged and awarded cash prizes at 5 p.m. The chalk competition includes a youth contest for ages 12 to 16 and an adult contest for ages 17 and up. No prior experience in art is required to enter. The Palatka Chalk Explosion is a member of the Florida Chalk Artists Association For more info call 386-328-8998.